New Scrutiny for Malaysia’s Old Submarine Deal? A closer look at the new government’s suggestion to probe old allegations around the country’s submarine procurement. This week, Malaysia’s new defense minister suggested that the government that ousted former premier Najib Razak in a shock election last month could look into a previous scandal around the country’s submarines that had dogged Najib for years. Though it is still far from clear how this will play out, it is yet another indicator that the new government now led by Prime Minister Mahathir Mohammad could be placing greater scrutiny on the country’s defense sector. As I have noted before in these pages, Malaysia’s two Scorpene-class diesel-electric submarines were procured from France in 2002 amid the shadow of scandal when ousted premier Najib Razak was defense minister. Malaysia had signed a 4.3 billion ringgit ($1.08 billion) contract for the boats with France’s Naval Group, and corruption allegations had surfaced over the defense ministry’s procurement. That controversy had remained even as Malaysia had considered procuring new submarines to streamline and modernize its current fleet (See: “When Will Malaysia Get New Submarines?”). One of the many expectations of Malaysia’s new government, which came into office following a shock election in May, was that it would investigate previous corruption allegations. If broadly conceived, this could be made to include not just the much-ballyhooed 1MDB scandal but also long-suspected irregularities tied to the defense sector as well. 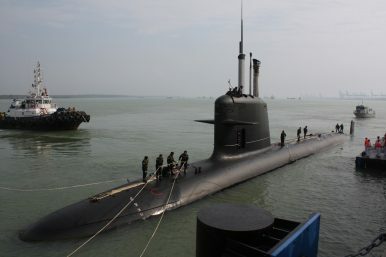 This week, the specter of a probe into the submarine deal was in the headlines again when Malaysia’s new defense minister suggested that a proposed task force could be created looking into the deal. In remarks first reported by Singapore-based media outlet Channel NewsAsia, Mohamad Sabu said that the government would create “an investigative task force” to investigate the allegations. Though he was careful to say that it was “too early” to comment on what shape that task force would take since it was still under discussion by the Cabinet, several media outlets nonetheless interpreted as a sign that this would be likely to occur. Despite continued new scrutiny into Malaysia’s old submarine deal, the extent to which this will actually translate into a thorough investigation and the outcomes that will arise out of that remain unclear. The new government has made a range of commitments tied to transparency and accountability on the defense side, including scrutinizing new procurements and investigating allegations of leaking of confidential documents. But actually following through on those and making progress on accountability could prove to be more challenging politically and institutionally, not to mention the long list of issues on the government’s plate including on foreign and defense policy (See: “Malaysia’s Foreign Policy Challenges Loom After its 2018 Elections”). But irrespective of those uncertainties, the consequences of this trajectory would no doubt be significant, not just for the old submarines deal or Najib’s fate but the overall approach the new government will take on defense policy and the broader outlook for the country’s defense modernization. Such decisions affect not just the country’s past but potentially its future as well.